Mark Dean Veca, known for combining the opulence of Rococo wallpaper with the renegade attitude of cartoons, comics, and street art, will paint a version of his mural "Phantasmagoria" in the Davies gallery in the Museum's historic wing. Veca paints intricate patterns akin to those in 18th-century toile de joue wallpaper. He fills the space with visceral and undulating shapes using the exaggerated black outlines typical of comic books and graphic novels. Now based in Los Angeles, Veca grew up in Livermore, California; the influence of the Bay Area's underground comix scene is evident in his psychedelic murals and intense color palette. "In Mark Dean Veca's work, MAD Magazine meets Versailles," said Monica Ramirez-Montagut, senior curator at SJMA. "He frames his intense, spectacular palette of fiery reds and oranges with an engulfing, white bubble shape that suggests - as in comic vocabulary - that the work is just a thought or a colorful hallucination. Whether it's his classic, virtuoso drawing ability, the Rococo pattern, or the imagery and attitude of graphic novels, I think all visitors will find something intriguing about this mural." Since the late 1990's, Veca has applied his fervent, large-scale drawings to architectural spaces, extending the art of cartoons, comics, and street art into installations. His personal style and his interest in different genres of art and design have led him to diverse creative endeavors, including streetwear collaborations in product design with Nike and OriginalFake. 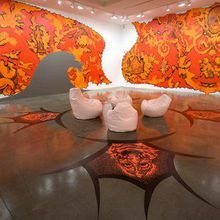 For this installation commissioned by the San Jose Museum of Art, he will create a room-encompassing work titled "Son of Phantasmagoria," a new variation of his 2008 mural, "Phantasmagoria." Bean bag chairs and whitewashed lighting will create a "sci-fi" space where visitors may hang out as they experience the mural. Veca will also start the outlines of a mural in the Museum's Cafe Too. Throughout the fall, visitors are invited to add their own contributions to this ever-changing mural. Marc Dean Veca was born in Shreveport, LA, in 1963, and spent his formative years in Livermore. In 1981, he moved to Los Angeles to study at the Otis Art Institute (now the Otis College of Art and Design) from which he received his BFA in 1985. At Otis he perfected his draftsmanship and learned how to scale a drawing to mural size. His work has been seen in numerous group exhibitions at museums and galleries across North America and Europe, and in solo exhibition at such venues as Instituto Cultural de Cabanas, Guadalajara, Mexico; the University Art Gallery at the University of California, San Diego; Otis College of Art and Design; Mars Gallery, Tokyo; and dozens of galleries in the United States.